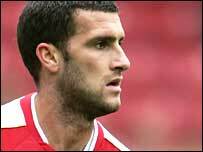 Birmingham have signed Middlesbrough's Stuart Parnaby on a three-year deal. The 24-year-old utility player moves to St Andrews on a free transfer after rejecting a new contract at Boro. Aston Villa, Everton, Sunderland and West Ham were also interested in the former England Under-21 international, who plays predominantly at right-back. Parnaby came through the ranks at Boro and helped the club to the Uefa Cup final in 2006, but has slipped down the pecking order under Gareth Southgate. He was first-choice right-back at the beginning of last season when Southgate took over as Boro boss from Steve McClaren. But he struggled to command a regular first-team place during the second half of the campaign. Is Parnaby a good buy for Brimingham? "The time had come for me to make a fresh start at a new club and I decided to join Birmingham after meeting Steve Bruce," he said. "He spoke really highly of all the lads and what a big club it is. "Everything was really positive and once I'd spoken to him I knew what I wanted to do. "I'd been at Boro since I was a 10-year-old so I thought it was a good time for me to make a new start and hopefully I can prove to the Birmingham fans what sort of player I am." Parnaby, who can also play at centre-half and in midfield, made a total of 127 first-team appearances for the Teesside outfit, scoring four goals. And but for a two-month loan spell at Halifax, Parnaby has spent his whole career with Boro to date. The deal comes into effect from 1 July.